Mike Ullery | Miami Valley Today Troy firefighters and paramedics carefully approach a crashed vehicle while avoiding live power lines in the 2000 block of East Peterson Road on Monday afternoon. The victim was not seriously injured but was trapped in his vehicle for around 15 minutes. Pioneer Electric was called to cut power to the downed lines. Casstown Firefighters provided additional manpower and and an engine. The energized power lines caused a small grass fire that was extinguished after the power was shut off. The crash is under investigation by the Miami County Sheriff’s Office. Troy firefighters and paramedics carefully approach a crashed vehicle while avoiding live power lines in the 2000 block of East Peterson Road on Monday afternoon. The victim was not seriously injured but was trapped in his vehicle for around 15 minutes. Pioneer Electric was called to cut power to the downed lines. Casstown Firefighters provided additional manpower and and an engine. The energized power lines caused a small grass fire that was extinguished after the power was shut off. The crash is under investigation by the Miami County Sheriff’s Office. 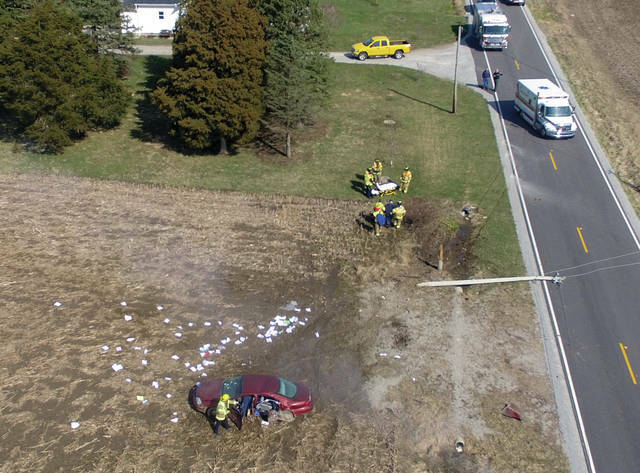 https://www.dailycall.com/wp-content/uploads/sites/30/2019/04/web1_040119mju_crash_peterson.jpgMike Ullery | Miami Valley Today Troy firefighters and paramedics carefully approach a crashed vehicle while avoiding live power lines in the 2000 block of East Peterson Road on Monday afternoon. The victim was not seriously injured but was trapped in his vehicle for around 15 minutes. Pioneer Electric was called to cut power to the downed lines. Casstown Firefighters provided additional manpower and and an engine. The energized power lines caused a small grass fire that was extinguished after the power was shut off. The crash is under investigation by the Miami County Sheriff’s Office.